Debate trophies outside of room 2240. Everyone has a different opinion on competition. Some love it, some hate it – but for the students on the debate team, it’s a part of their everyday life. That mindset was obvious last year, which is widely considered the team’s most successful ever. The team of Nathan Glancy and Nasim Salehitezangi (both seniors last year) finished their year ranked sixth in the nation. 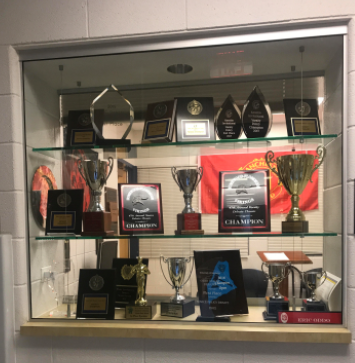 During the year, they took home their first IHSA state championship title, had two top-16 appearances at two different national tournaments, and a second place finish at the final nationals tournament. That success didn’t come out of the blue — the team has been steadily climbing in the national ranks since its founding eight years ago. Despite last year’s success, the team’s hard work is far from finished. Over the summer, some members of the team took their commitments a step further and attended debate camp. Most teammates attended the University of Michigan’s summer debate institute, with five students spending seven weeks there, and others spending three, four and five weeks. But there’s a catch — it’s not the kind of summer camp you’re used to. This summer’s camp season was a success. Secretary and senior Nadia Firozabadi said camp has been a huge help this year. “My camp experience this summer was really unique and educational. I was surrounded by a lot of competitive and smart debaters which really motivated me. I got to work with a lot of really successful coaches which was a great resource and source of help,” Firozabadi said. Debate doesn’t finish with the end of a season; rather, students compete yearlong, and the work is intense. The most committed students attend upwards of 5 tournaments a semester, oftentimes overlapping with school. It’s difficult for students on the team to strike that critical balance, but it comes with practice. “Balancing the schedule with school and other obligations is just something you pick up over time. It helps to have a planner, talk to your teachers about assignments you’ll miss, and just generally having a good grasp of what assignments you’ll do and when,” Chikko said. The team’s practices are held Tuesdays and Wednesdays. The atmosphere is fun but serious — every student is passionate about their work. This month, the team is preparing diligently for upcoming tournaments. Up next on the schedule is the Greenhill Fall Classic, happening Sept. 15-17. The team outlook is great — but there’s no unhealthy pressure. For students interested in joining the team, practices are held after school Tuesdays and Wednesdays in room 2245.